The Frosh/Soph Boys defended their 1994 title by beating Saratoga with a score of 46 to 54. Nathan Wright (6th overall) led the way for the Vikings with a 11:30 clocking over the 2.1 mile course. He was followed by Aman Sirohi (9th), Kamil Kolacek (10th), Matt Powell (15th) and Lucas Yun-Nikolac (17th). Jeff Stokes, the 6th man, was just a tick behind in 18th. A mere 39 seconds separated our 1st to 5th man, where anything under 45 seconds is considered excellent. Note: These guys cost me alot of pitchers of soda at our annual pizza party we have after the race since I buy a pitcher for every medal earned. Varsity Girls saw us take 6th place overall out of 10 teams with Amie Wu placing 2nd (13:16 - 6th on the All Time list) and Victoria Quevedo placing 20th (14:38) and getting the last medal awarded. Victoria was in 22nd place with 500 meters to go and a teammate told her she needed two in order to medal. Well, she got the two and this added two more to the medal count. Also in the Varsity ranks was Cindy Wang (16:04), Stephanie Chan (16:20) and Grace Lee (17:09). Varsity Boys also had a 6th place finish but ran without Nathaniel Jue, one of our top 5 runners. I believe with Nathaniel we can catch Fremont next time out which beat us by 3 points at this meet. The team was led by Paul Neves at 11th (11:28) and Henry Shu at 25th (12:07). Rounding out the Varsity team was Nick Heimlich (13:00), Eddie Seok (13:34) and Michael Chou (14:41). Paul gave us an additional medal making it 7 pitchers at the party. On this Saturday morning, the Lynbrook Cross-Country team got a real treat, and their eyes opened. By participating in the Stanford Invitational and by passing our standard RAM Invit, we saw some of the best High school teams in the state as well as some of the best individual runners in the Nation. The JV boys started the day off running the 3000M course (Varsity teams run a full 5000M). With over 200 runners in the field, Nick Heimlich (our #1 JV runner) just wanted to beat more people than he did in his last race (which was 20 runners). Well he did just that, finishing at 137th with a time of 12:02 on the 3K course. He was closely followed by Trung Nguyen (12:18) and Matthew Wishnack (12:20). Unofficially, I had us finishing 25th out of about 30 schools. The Varsity girls were next on the line and there was an excellent race between Kristen Gordon (Carondelet) and Elaine Canchola (Nordhoff). Elaine led for the entire 3 miles with Kristen just a tick back the whole way. But when it came to the last 200M kick, Kristen showed her speed and edged out Elaine at the end although they were both given the same time of 18:22, what a race! Lynbrook's Amie Wu led the Vikings with a 39th place finish (21:11), followed by harrier Victoria Quevedo in 130th (23:16). It was Victoria's sister, Mariel, that made the difference in the team scoring. Lynbrook was tied with Calaveras but won the tie-breaker with our 6th woman (Mariel) beating Calaveras' 6th woman. Next up. Varsity Boys. This day was just not meant to be for the Lynbrook Boys. On the way over, Paul Neves (our #1 runner) got a flat tire and he had another Varsity teammate with him. By the time they arrived, the runners were on the line. Jeff Stokes got out of the car and on the line in time but Paul was left in the parking lot at the sound of the gun. This required Freshman Aman Sirohi to lead the way which he did admirably with a 19:14 clocking. Pacing paid off for Aman for he was the last Lynbrook runner at the mile mark but then passed all of his teammates by the 2 mile mark. Following Aman was Jeff Stokes in 19:40 (and with no warm up) and then Lucas Yun-Nikolac (20:28) and Henry Shu (20:46). But, as you can see, we had only 4 finishers which made us an incomplete team. It was a tough meet! Normally, this event is held on the same day as the Stanford Invitation which keeps the number of entrants down to a manageable number for this 2.33 mile course. This year, however, everyone and their brother was there since it was the only game in town. In the Large school races, each race had an athlete or two take a spill which sent the coaches grumbling and the runners looking for some LARGE Band-Aids. They had over 2000 athletes, a record by over 400, and not even Stanford could compare in sizes (heck, the Varsity Boys race had over 260 finishers alone). For Lynbrook, matters were worse. Due to prior conflicts and those nagging injuries, we were only able to field a complete team in the Varsity Boys race, leaving the other 3 races with incomplete teams. In the VB race, we were missing #1 runner Paul Neves due to a bursitis (sp?) problem. He will be out for two weeks. Henry Shu and Nick Heimlich ran strong but our lack of depth really hurt us. Our top two Varsity Girls had off days with only Mariel Quevedo having a top performance for us. On the Soph/Frosh Boys we had super runs by Aman Sirohi and Jeff Stokes (both running faster than our #1 Varsity runner). But with just Matt Wishnack as our only other runner, the team came up short. 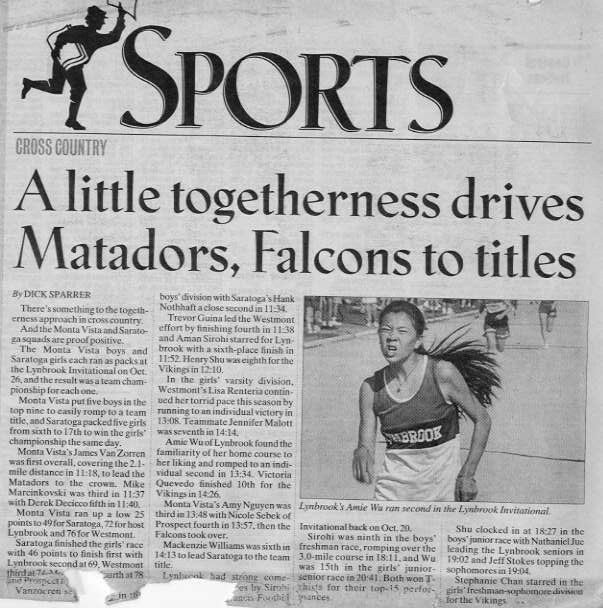 The Soph/Frosh Girls story was even one worse with just Stephanie Chan and Jennifer Chang as finishers. The shinning light is that it served as a wake up call to the team with only 3 meets left before League finals. The girls are looking to advance to CCS but must get past Homestead to do so. The guys are looking for a top finish but realize there is a ton of talent out there. Our next meet is this Thursday at Crystal Springs. Lynbrook's first crack at the difficult Crystal Springs cross-country course turned out to be a bonanza. After some extremely tough competition for our last 2 meets (Stanford Invit & Artichoke Invit), we were able to get back into the thick of things. The Varsity Boys ended up as an incomplete team due to injuries but those that did compete all improved from their previous years time. Henry Shu led the way with a 1:30 improvement with a 18:27 time. Nathaniel Jue, who hadn't run this course in 2 years, also improved by 15 seconds with a 18:40 finish. The JV Boys really cranked one out with a first place finish (43 Vs 49) over an extremely tough Gunn team in second. The individuals of Kamil Kolacek, Nathan Wright and Aman Sirohi finish 2nd, 3rd and 4th, respectively. The win was bittersweet since I graduated from Gunn and was an Assistant coach there from '88-'91. 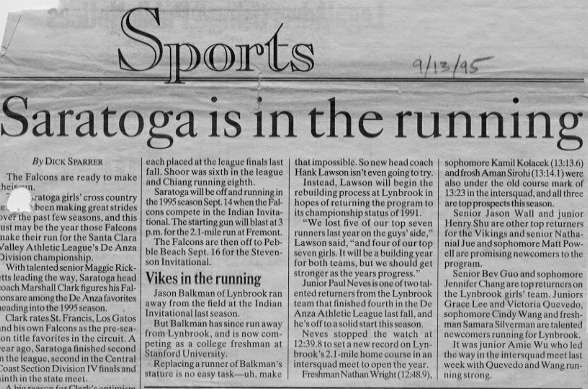 The really exciting thing, is that when you merge both the Varsity Boys and JV Boys races together, based on time, we actually come out tied with Saratoga High, a team considered a favorite for the League title (computers are wonderful). The Varsity Girls also had an incomplete team but was led by our consistent one-two punch of Amie Wu and Victoria Quevedo. Amie finished 8th overall with a 20:43, her first time on this course. The JV Girls came through with a great performance just like the JV Boys, with a 3 way tie for 3rd place. Stephanie Chan, Cindy Wang and Grace Lee led the way for the Vikings. Look for these girls to be running Varsity for the League meet when Lynbrook attempts to qualify for CCS it's second straight year in a row. St Francis/Foothill Invitational is our next meet but we're really looking ahead to the Lynbrook Invitational when we get to go head-to-head with the local teams on our home course. Then of course comes League and hopefully CCS. A most difficult week to accept. I lost my #1 Freshman (#2 Boys Varsity) for the rest of the season. Little hope that he'll be back for League. My #1 Varsity runner is off the injured list but has lost 2 weeks of valuable training. Another top runner is on the merge of mono and my #3 Varsity caught a cold. A tough week indeed. OK, enough griping, off to the races. Some of the highlights out of all the Boys races (you see, you run in your age class, ie Fresh, Soph, Junior, Senior, and not as Varsity or JV). Aman Sirohi won a Top 15 shirt in the Frosh Boys race with a 9th place finish and a time of 18:11 on the 3.0 mile course. Jeff Stokes ran a Varsity quality time of 19:04 in the Soph Boys race being Lynbrook's first finisher. Henry Shu ran 18:27 in the Junior Boys race running the 2nd fastest time of the day for Lynbrook. Nathaniel Jue ran 19:02 to lead Lynbrook's Seniors. In the girls races, we continue to run strong, without injuries or illnesses (knock on wood). Due to a 'Debate Tournament' we had an incomplete team in the Soph/Frosh girls with Stephanie Chan leading our incomplete team with a 23:09 time. The Junior/Senior Girls came through with a fine finish, once again beating my Alma Mater, Gunn HS (although Gunn did beat us in the Junior Boys race). Amie Wu was the Lynbrook top finisher in 15th place (getting the last T-Shirt for that race) in a time of 20:41. The team we need to beat at our League finals on 10/31, to qualify for CCS is Homestead High. When I merged the two girls races together, the scores were 285 for Lynbrook and 610 for Homestead. Of course alot can happen in 10 days but we're staying focused in order to get back to the CCS meet, which was our pre-season goal. It was the first time that any of the coaches from the other teams could remember a X-C meet being held at Lynbrook HS, and it was about time. There were 6 schools present; Saratoga, Monta Vista, Prospect, Westmont, Fremont, and host Lynbrook. It was set up as an opportunity for athletes to run a short, fast, flat course before League finals and the athletes did just that. Course records were set in every age division (FR - SE) and in some cases, multiple people broke the old records. Leading the way was Lisa Renteria of Westmont who ran 13:08 beating the current course record holder, Amie Wu of Lynbrook, by 26 seconds. But it was Saratoga that came out on top in the Girls Varsity team race with 46 points, followed by a much improved Lynbrook squad with 69 points and Monta Vista in 3rd with 74 points. "We're looking for a top 4 finish in League," say Lynbrook coach Hank Lawson, "so we can qualify for the CCS meet on Nov 11th." If Lynbrook continues to improve, they might even give Saratoga a run for their money. Other girl record breakers were Jennifer Nguyen (SO) of Monta Vista in 3rd with a 13:48 and Sueh-Han Liew (FR) of Fremont in 5th with a 14:06 clocking. On the Varsity guys side of the meet, they duplicated what the girls achieved, records in all divisions. James Vanzoeren of Monta Vista started it off by breaking Paul Neves course record with a time of 11:18 (Paul sitting this race out due to an injury was unable to defend his record). Then Hank Nothhaft of Saratoga broke the Junior record with a fine 11:34 for second place. Greg Johnson of Westmont now owns the Soph record with a 12:20 and Lynbrooks own Aman Sirohi wrestled away the Freshman record from teammate Nathan Wright with a 11:52 time and a 6th place finish. In the team scoring, Monta Vista ran away with the team title with 25 points compared to 49 points for Saratoga in second place. Lynbrook was 3rd with 72 points just squeaking by Westmont who had 76 points. Everyone on Lynbrooks team improved their times on this home course since the beginning of the year which shows continued improvement. Just what I, as the coach, want to see some 5 days away from the League meet.